Long term, if the projections are right, NYC as we know it will not exist. It will be a very different place. On the other hand, the odds are against another Sandy in the next 30 years, or even the next 100. Storms don’t usually move east to west. It is the reverse. Thus a normal hurricane would either hit New Jersey first and weaken, or hit Long Island with NYC getting the back side and the winds pushing the water out to sea. Sandy really was the worse case scenario. True, but it appears that the so called 100-year storm event is happening every few years & not just in NYC. Sandy had a strange trajectory, especially given it didn’t originate in the Atlantic. Usually hurricanes follow the trade winds and if they hit us they travel in a northwesterly trajectory. Well, not sure I would worry about trajectories so much, but even if we get storms at the same approximate rate they could be more intense. Nope. We had a worse storm in 1821. The Norfolk and Long Island hurricane skimmed up the coast and hit NJ as a Cat 3 or Cat 4 storm. It also made a direct stike on NYC, and generated a 13 ft storm surge at the Battery at extreme low tide. With 1+ ft of local sea level rise since then, that translates to a 14 ft to 20 ft storm surge around NYC today. Hurricane Ike (2008) had the same intensity as Sandy. It generated a 25 ft work surge in less favorable littoral geography (Eastern Texas) than Sandy (New York Bight). If a more tightly wound storm like Ike were to strike with the trajectory of the 1893 New York Hurricane, it would pack a 30-35 ft storm surge. A storm like that is the worst case scenario, and would generate hundreds of billions of dollars of damage. It would make Katrina seem child’s play. Depending how ready and sharp the bureaucracy and politicians are, and how willing residents and businesses are to listen and act in a timely manner, we could be looking at death counts in the teens to tens of thousands. It would leave millions homeless, and possibly disrupt economic activity enough to trigger a recession. You have no evidence that it is now 1-in-30 years vs 1-in-100 years. I love the smell of climate change denial in the morning. I watched something on Miami & the video noted that – the entire metro area is six feet above sea level & the coastal areas like Miami Beach have been dealing with ever increasing street flooding do to climate change. As a short term solution, new piping is being installed to draw storm water. A longterm solution is still being developed & yet too slowly for an area that seeing rapid population growth. There is no long-term solution for Miami. Miami will be gone in a hundred years. You mean Miami Beach. MB is a separate political entity and is on a barrier island. Anyone who took 9th grade earth science knows that barrier islands “move” under natural forces. Moriches Inlet did not exist until the Hurricane of ’36 came through. The Army Corps of Engineers have helped prop it open since then. Look at any ariel photos from the 30’s and compare it to today. In 80 odd years a lot natural buffers like wetlands have been filled in and streams have been channelized into combined sewer system. Throw in the lack of maintenance and upgrades to any of the infrastructure and you will have a recipe for disaster. No, I meant Miami. A hundred years was a bit of hyperbole–but with 10 feet of sea rise, Miami will be a collection of small islands. And right now we’re on track for minimum 6 feet by 2100. It will be higher up than Amsterdam, and Amsterdam is doing fine. Do you really believe that the federal government will undertake the herculean tasks necessary to keep Miami above water, when the same will be needed for many other area of the country? I mean, maybe they will–but I tend to doubt it. I have my doubts we’ll be able to keep the water out of New York. No. Nobody will spend the money on Miami, because Miami is impossible. *The bedrock is porous and water-permeable*. This means the level of water in the bedrock will ALWAYS rise to the level of water in the ocean, and there is NO way to stop it. New York is at least built on solid rock. It can be saved. Miami can’t be. I suspect the population of Miami will head for Orlando, which is a bit higher up. It depends on how much money Miamians want to spend to be able to stay in Miami. And how much the rest of the country wants to keep them from competing for their real estate. Is Miami considered part of “the real America?” The northeast & the west coast aren’t according to Sarah Palen & others like her. I think that region of Florida is sort of the Malibu of the right-wing talking heads set (not to mention C-listed and D-listed celebrities), but it may be more Palm Beach than Miami. Miami is probably lapis lazuli blue. No, Miami can’t even do that. The sewer and water systems would have to be replaced and they’d have to be replaced *above sea level*, which means *above ground*. It’s simply not going to happen. The cities which were raised generally didn’t have water and sewer systems at the time, or at least the water and sewer systems remained located above sea level. Of course the climate changes. NY for the most part was once covered with 2 mile thick ice sheets, is home to some of the oldest rock formations in the world and hosted a vast inland sea. About 14,000 years ago you could of had beachfront property 50 to 100 miles off the coast of Coney Island, but changes in climate had a hand in literally washing out what is now the Hudson Valley. https://www.whoi.edu/oceanus/feature/the-great-flood-of-new-york. Also it was all before the internal combustion engine. In a geologic wink of an eye, 500 years ago Manhattan island was a completely different place. “Civilization Happens” it was essentially “flattened” by “progress”. Also 1/3 of the island is a collection aggregate, garbage and hazardous waste and no “tax on carbon” is going to change that. I will wait till Al Gore gives up is million dollar Malibu mansion and John Kerry’s fuel guzzling 7 million dollar yacht before I will go along with that malarkey. As it turns out, even without the boat race to decide ownership, Staten Island did properly belong to NYC, because it was connected to Brooklyn at the Narrows, from the debris left over from the recreating glaciers. Depends on how the comment was intended. I had pretty much the same reaction to that number not out of disagreement with the underlying premise, but rather because no citation was provided for it. We know, qualitatively, that we can expect severe storms to be more frequent. But I wouldn’t put a specific number on it without pointing to a study of some sort that shows how that number was determined. I do also think stating that Sandy is a 1 in 100 year event is a bit overly simplistic as well. Prior to Sandy it had been nearly 200 years since NYC last saw a storm surge of similar height, so “1 in 100” may be understating its relative severity. Meanwhile in terms of wind it was only Category 1 force, which NYC sees considerably more often than once every 100 years. And the amount of rain was unimpressive. So by those metrics it wasn’t that bad. Sandy had an oversized storm surge for a category 1 storm, in part because its unusually large size allowed it to sustain lower barometric pressure near its center without being more intense, and in part because the minimum pressure happened to unfortunately coincide with high tide during a full moon, effectively giving NYC the maximum possible surge such a storm could create. Had the storm hit six hours earlier, or a week earlier, it would not have been as bad. When it comes to such rare events, any estimate of the frequency is pretty much a guesstimate. Let’s assume you have an event with a true frequency of once every 100 years. Some unlucky centuries the event might occur three times. Many centuries, it wouldn’t occur at all. Getting enough data for a good estimate of the frequency would take several millennia. Add in the possibility that the true frequency is changing, as is the case with climate change, and all bets are off. In other words, I agree: the 30-year figure is made up, although it sounds plausible enough. Sandy was an intense storm spread out over a 1000+ mile diameter cyclone. Hurricane Ike of 2008 was a similarly intense storm that was dismissed for just being a Cat 2 storm. It drove a 25 ft storm surge that annihilated the Bolivar peninsula and flooded Galveston from behind. We didn’t learn the lesson from Katrina, Ike or Sandy well. Regional geography, underwater topography, and large intense storm fetch can generate huge storm surges. It still boggles my mind that there appears to be no way to build components that are not completely destroyed when submerged in salt water. Can’t we put a team of scientists on this task? It’d appear to me that if there were any way to do this, it’d be preferable than continuing to try in vain to seal everything from the elements. Water will always find a way into the tunnels, and NYC is surrounded by salty sea water. NYC can’t be the only city with a subway that’s surrounded by sea water, where flooding occurs. What are other cities’ transit systems doing? Fun fact: There are actually Roman structures at the port of Caesarea Maritima that have survived being exposed to the ocean for 2000 years. They’re made of a peculiar concrete blend that gets stronger with exposure to salt water. The answer to this is two part. First, saltwater is ridiculously corrosive, and eats away at pretty much every material associated with human technology. This includes stainless steel, because it’s only relatively impervious to rust: it will break down in a high salinity environment. * Plastics break down readily in salt water. It will also corrode exposed copper. Short of sealing everything in concrete, you can’t fully protect these materials from a saltwater flood. You definitely can’t protect them in an environment like the subway, where they need to be readily accessible for maintenance. Second, it isn’t just the saltwater, it’s the weight and pressure of the water. Water is incompressible, and when you squeeze that much of it into tunnels and crawlspaces, it’s going to eat away at all the defenses. So we could (for instance) wrap copper wire in polyethylene (which is what undersea cables are wrapped in), but when a billion gallons of it rips the conduit off the wall, the water is going to get in anyway. Obviously, the MTA should be doing things to mitigate the effects of a flood, like making sure wires are as corrosion-proof as possible, and I’m sure they are, but ultimately keeping the water out in the first place has to be the first priority. It’s the difference between preventing cancer and treating it. * Why don’t boats rust away? Sacrificial anode. Look it up, it’s cool. Also: New York is unique in being a very large city directly on the ocean with a relatively old subway system. Look at the metro systems by ridership: no one else is even close to this exposed to the ocean. The bulk of the system is on two islands, with most of the underground parts on Manhattan, which is very flat. Hong Kong is sort of comparable, but most of its system is above ground, it has very few stations relatively to NYC, and the system opened in 1979. 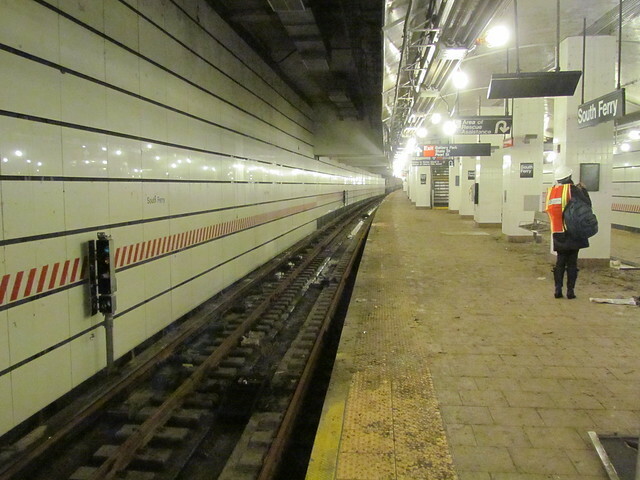 The subway was practically built to be flooded. Tokyo? London is scarcely further above sea level than New York and it’s quite prone to tidal flooding. That’s why they built the Thames Barrier. There are solutions to these problems. You just actually have to get them built. One of the post-Sandy ironies was that the best system in place to deal with the flooding from the storm was installed by the Interborough Rapid Transit Company when they built the Contract 2 stations and the Dual Contracts extension north of Grand Central — the pneumatic pumps installed 90 years earlier kept the Joralemon St. tunnel from suffering the fate of most of the other East River tunnels south of Midtown, even though Joralemon St. runs right under South Ferry, next to the heavily-damaged Montague St. tunnel and above the flooded lower South Ferry station (which basically drained upper SF during the storm). So what the IRT did between 1908 and 1918 using early 20th Century technology was better than what the MTA did almost a century later to deal with potential flooding, when they built lower South Ferry. It would probably be prohibitively expensive to retroactively install pumps on all the other lines, but at the very least the MTA should consider doing something with the lines closest to the river and in other low-lying areas. Do we know how far along the repair of South Ferry is? I never understood why the repairs cost more than the redesign that had just been completed. I don’t understand why it would take 4 years to get it back open, either. I am going to miss this South Ferry renaissance that we’ve gotten thanks to Sandy. I really wish there was some way we could have both South Ferrys open. Bring back the 9 & have it operate out of SF Loop. …or just get AECOM SVP to tweak their 1 train to Red Hook plan to run the tunnel to Brooklyn through lower South Ferry, instead of splitting off south of Rector, and keep the 9 train using the upper SF loop as its southern terminal. There’s still no money to do that, but it’s one way to keep both stations in service. Just let it flood, then get disaster money. It’s Federal money, which means free. ^ It’s kind of funny how phantasmagorical this comment is.